In a world filled with video games and cell phones, there's something positively refreshing about traditional wooden toys. Simple. Elegant in design. These kitchen and food themed play sets, tables and chairs from PlanToys aren't just crafted to last a lifetime, they are also made of the best sustainable materials available. Whether playing house with tiny refrigerators and microwaves or hosting a picnic with their stuffed animals, your little ones are certain to cherish these pieces for years to come. Pass the butter, please? 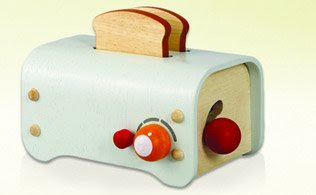 Wooden toaster comes with 2 pieces of toast and has a pop-up and timer function; made with eco-friendly materials. Constructed with soy and water-based dyes, E-zero non-toxic glue, and recycled/recyclable materials. Product dimensions: length 13", height 8", width 7"